Mini Chocoplot ‘Book Signing Tour’! Bank Holiday Monday 28th May 2018 – Northumberland County Show – Schedule to be confirmed, but I’ll be there somewhere! Sat 23rd June – Waterstones Hexham – Times to be confirmed, but possibly 11am – 2pm like the rest! 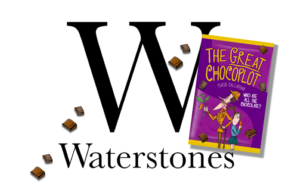 It would be great to see some friendly and enthusiastic readers waving copies of ‘The Great Chocoplot’ at me. So please come along and say ‘hello’!